Arches National Park has over 2,000 natural arches, but Delicate Arch is probably the most iconic arch in the park. 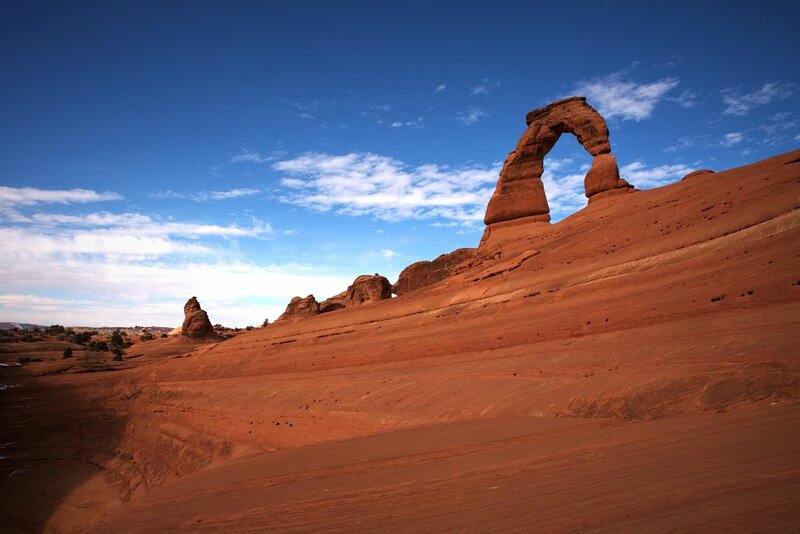 The arch is a symbol of Utah and more broadly the west, and it’s one of the most famous rock formations on Earth. 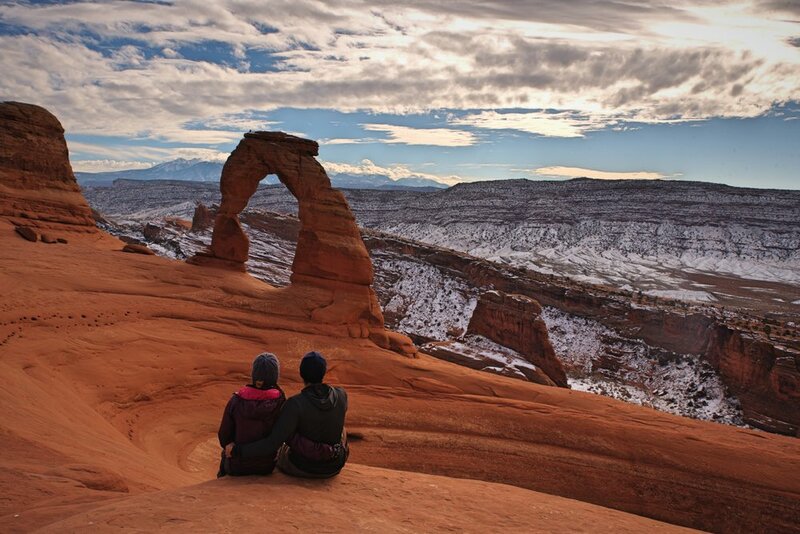 When people picture a natural arch, there’s a good chance that they picture Delicate Arch. Viewing thousands of beautiful pictures of Delicate Arch can’t even compare to standing under the huge arch and experiencing it in person. 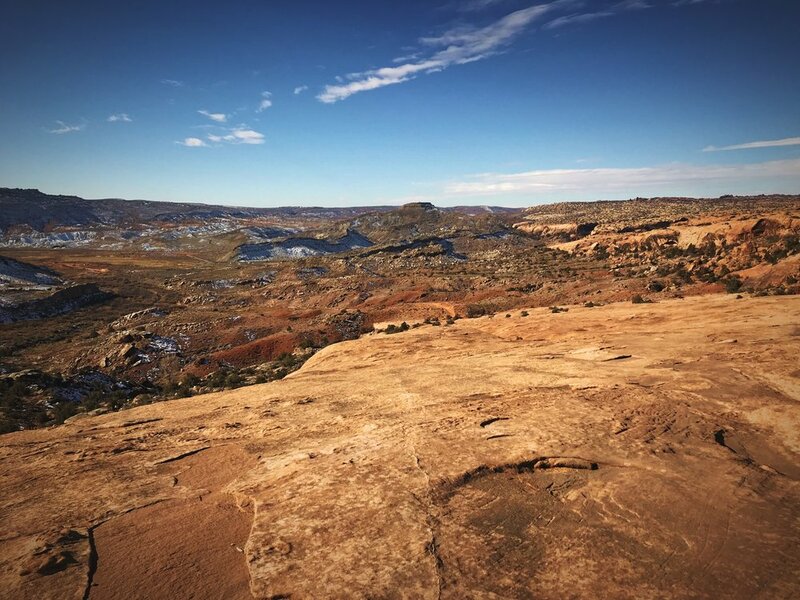 While there is a viewpoint that allows you to witness the arch from a distance of a mile, the three-mile round-trip hike is the best way to see Delicate Arch. Winter can quickly change the trail conditions, and you might fall like this guy. The trail to Delicate Arch has beautiful views along with the beautiful arch. 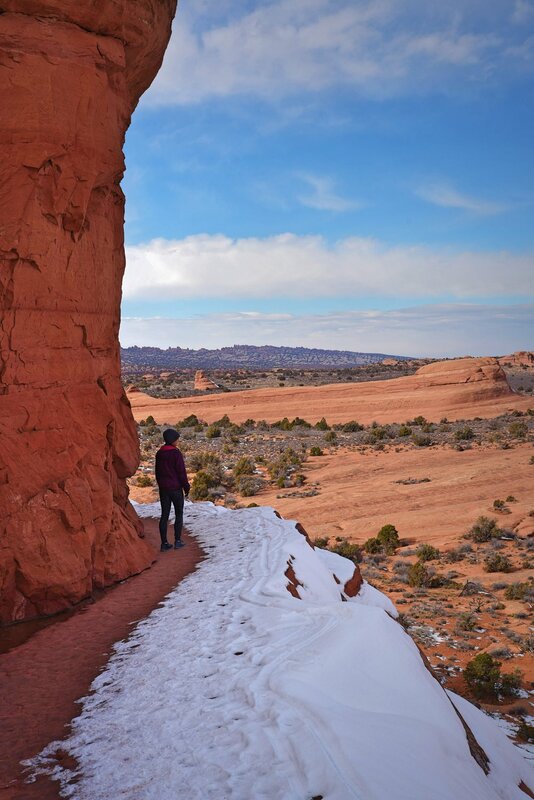 Hiking to Delicate Arch in winter can be a bit chilly, but you’ll get a lot more solitude at the arch. Although the Delicate Arch trail is only three miles long, it has 480 feet of elevation gain and is rated as strenuous. 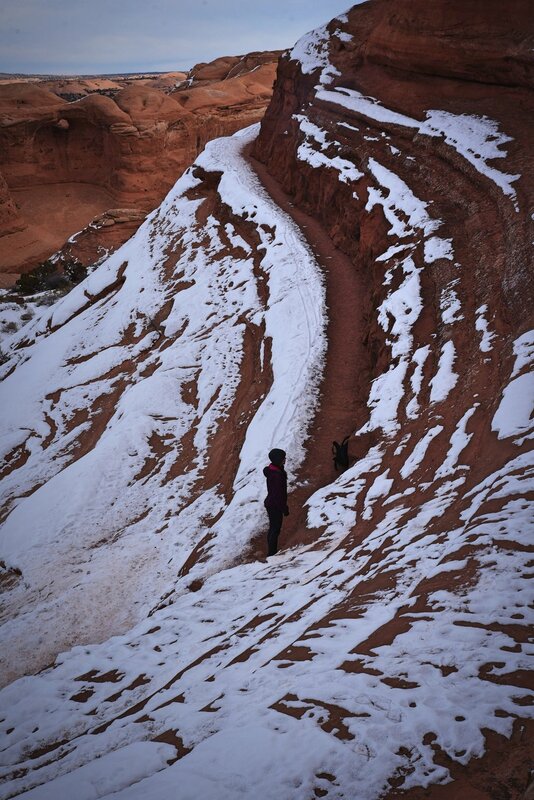 We hiked the trail in mid-December, and winter weather can change the conditions of the hike. You won’t have to contend with the blistering heat of summer, and it’s likely one of the few times you’ll be able to enjoy Delicate Arch without crowds. 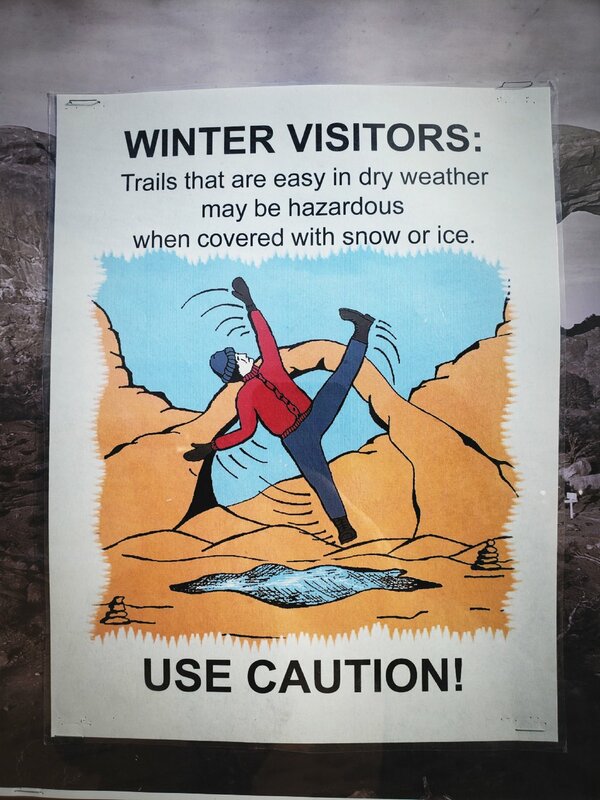 However, you may encounter icy conditions that could make the trail dangerous. Traction devices for your shoes may help, but you should be prepared to turn back if it’s too slippery. The trail begins at Wolfe Ranch, the homestead of John Wesley Wolfe and his son Fred who lived there in the late 1800s. The father and son lived alone on the ranch for 10 years farming using the water from the nearby Salt Wash. They also grazed over 1000 head of cattle, which substantially decreased the native grasses in the area even to this day. 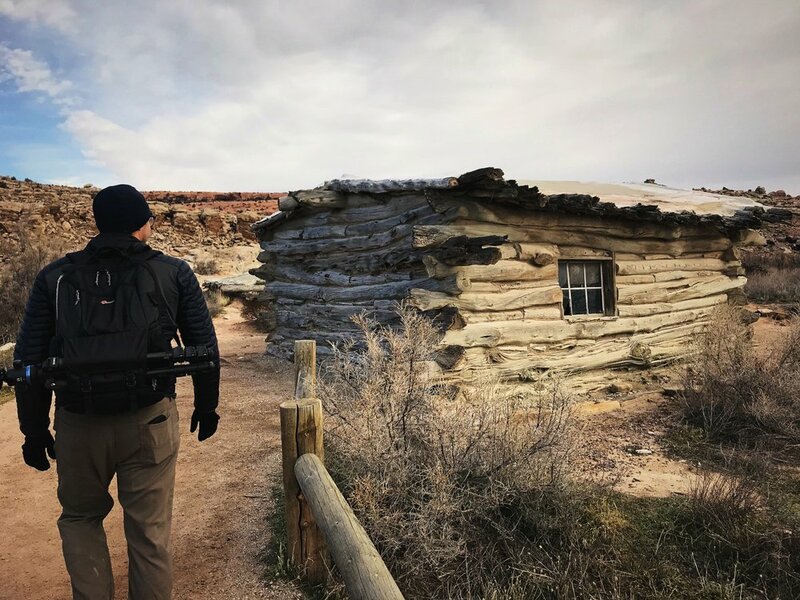 The one-room cabin at Wolfe Ranch on the way to Delicate Arch. Fred Wolfe and his son originally lived by in this dugout cabin. 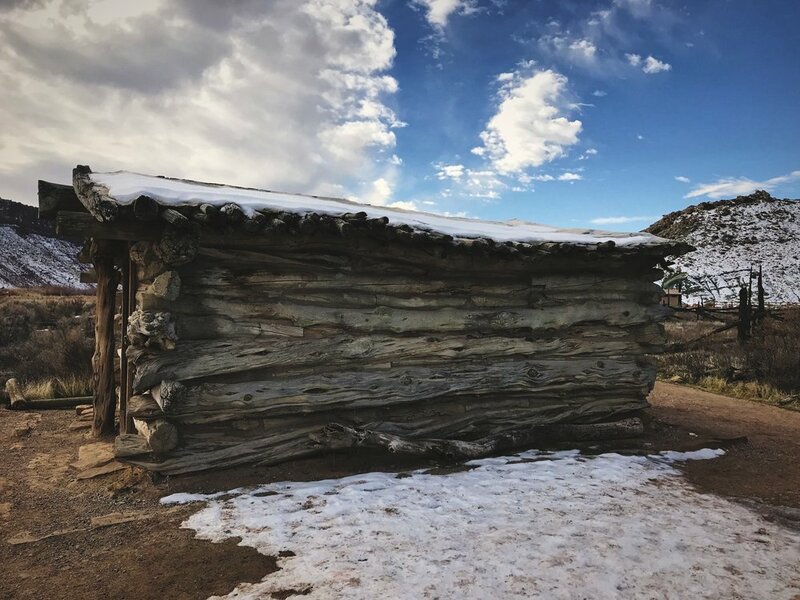 In 1906, Wolfe’s daughter, Flora, and her husband and two young children joined them on the homestead and insisted that they build a decent cabin, apparently being appalled at the condition that the Wolfes had been living in. 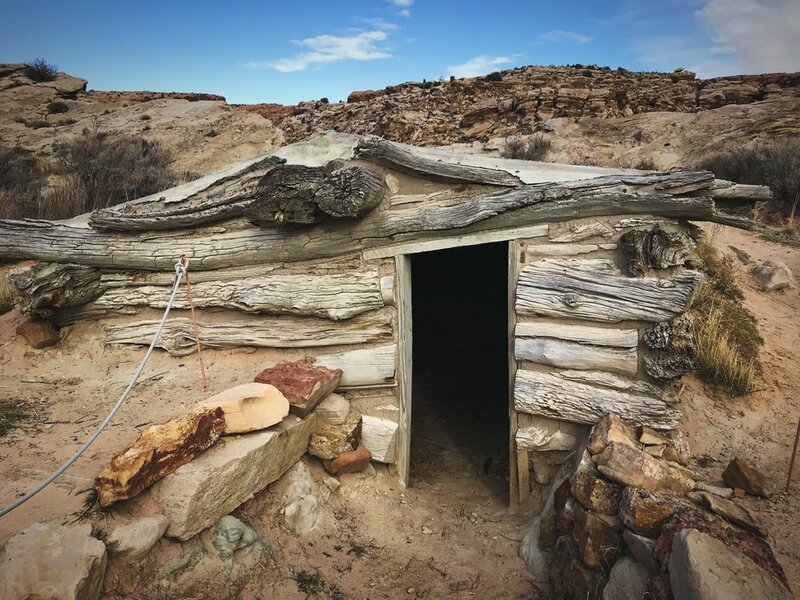 That stout one-room cabin of Wolfe Ranch still remains today, although it has been weathered and silvered by the dry desert conditions. The cabin has a wood floor and real glass windows, which were a luxury in the West at the time. Somehow the entire family of six slept and lived in the 17 by 15 foot cabin. (That’s like twice the space inside our van for six people.) After just two hard years, Flora and her family returned to Ohio because they disliked living in the harsh Utah environment so much. Ian checks out the cabin at Wolfe Ranch near Salt Wash. Although life may have been difficult for the Wolfes (Wolves? 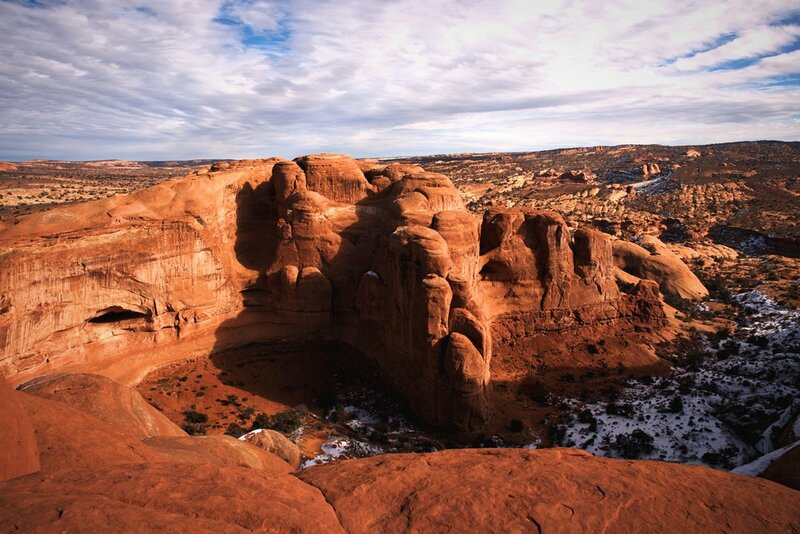 ), native people had been living and thriving in what is now Arches National Park for thousands of years. Just beyond Wolfe Ranch across a bridge over Salt Wash, make sure to check out evidence of earlier human life at the Ute rock art panel. 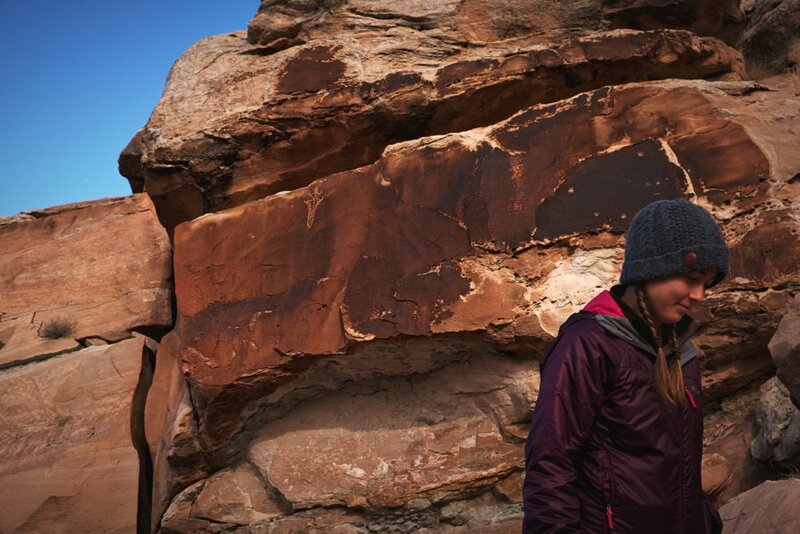 Petroglyphs are chiseled into the desert varnish that has darkened a sandstone wall near the wash. 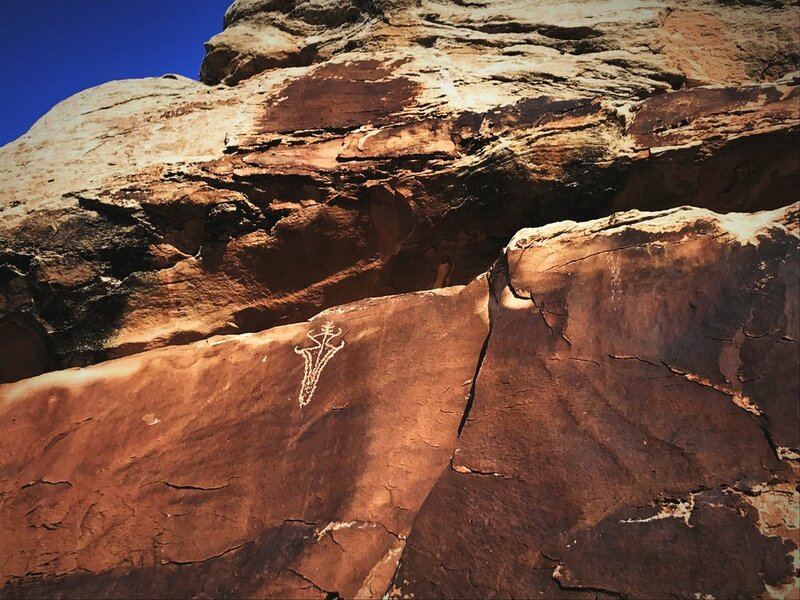 The Ute Rock Art along the Delicate Arch Trail is really beautiful. There is one small petroglyph that is separate to the left of other grouping of petroglyphs. The Ute petroglyphs are really defined in the dark desert varnish on the rock. Here is the solitary figure with a headdress that many people probably miss. After the Ute rock art, the trail continues to be flat and sandy for a little while longer, and then you begin to climb a slope of exposed slick rock. Follow cairns up the rock to make sure you are heading in the right direction. In some places there are staircases carved in the stone to help you ascend the slope. This portion of the trail has no shade, and we even in winter we got a bit warm on this slope. In summer this part of the trail would probably be very hot, but in winter we were comfortable. 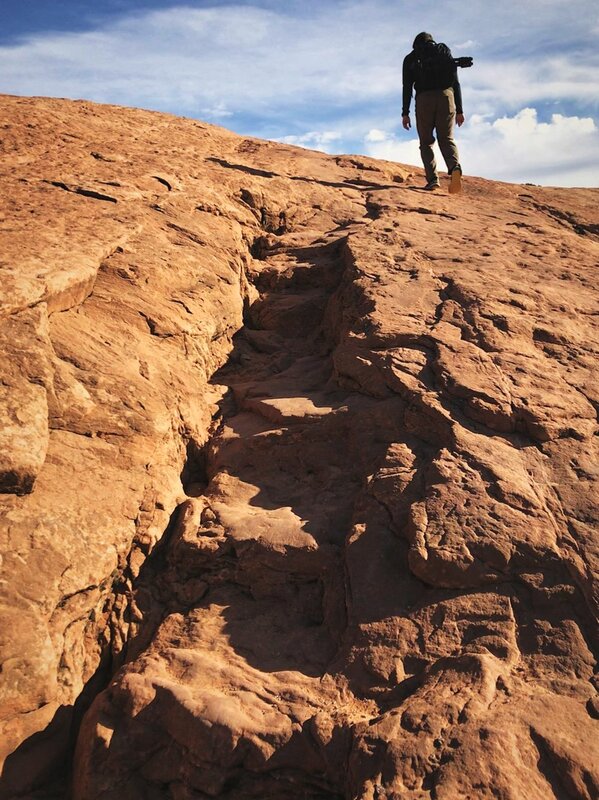 This is the long slick rock slope you have to climb to reach Delicate Arch. Beyond the slick rock, the trail to Delicate Arch levels for a while as you wander up a wash surrounded by junipers. Then you walk along the edge of a rock wall with a bit of scrambling. This part of the hike was a bit icy when we were visiting. It was pretty easy to go around the ice though. In some places stairs are carved into the stone to help people climb. 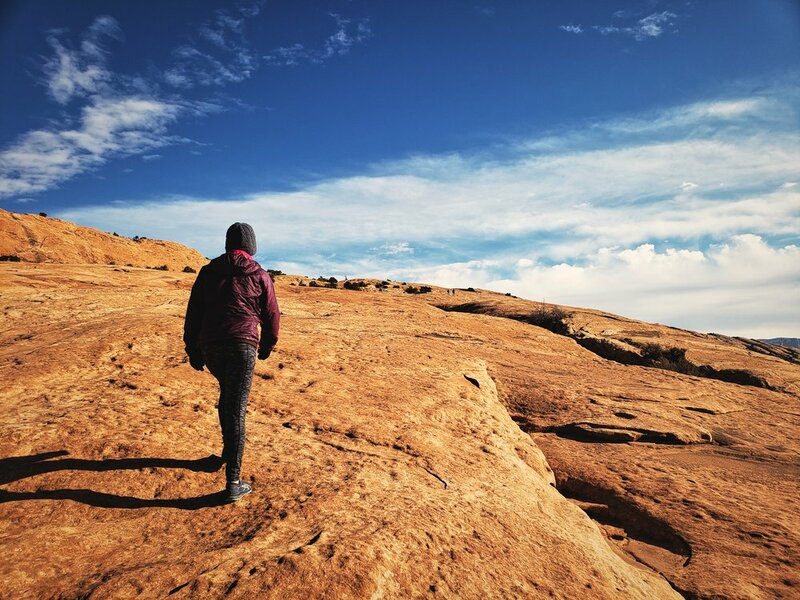 Don’t forget to look around you while hiking to Delicate Arch. You will be treated to gorgeous views. Ian hikes the final portion of the slick rock slope. The trail then goes down between those two large rocks. 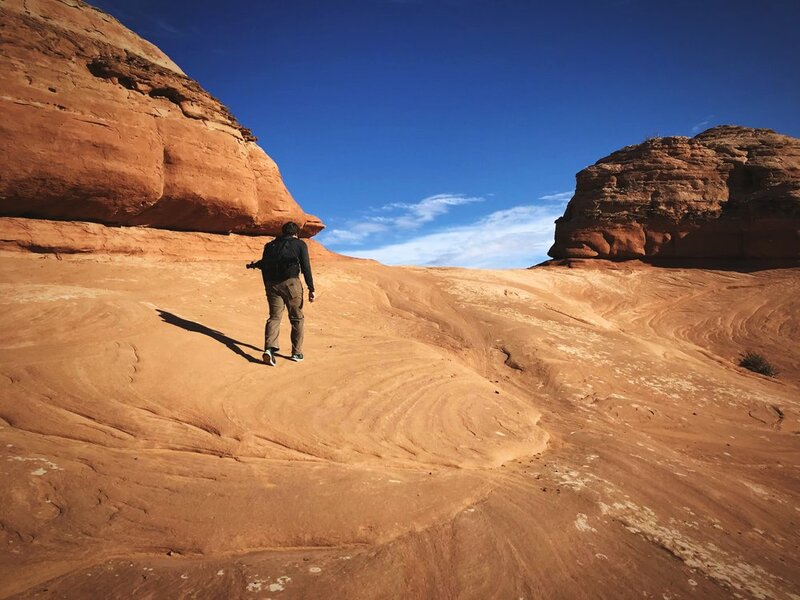 Don’t forget to look around while hiking the final portion of the Delicate Arch Trail, because there are some small arches and the beginnings of arches that can be spotted. The final 200 meters of the trail is on a narrow rock ledge with a long drop off to your left. Fortunately this portion is slopes inward and was largely clear of ice, but this ledge could easily become dangerous. The final portion of the Delicate Arch Trail is on a ledge along a rock wall. Fortunately the inside of this ledge was totally clear of ice when we were hiking. The scale of Delicate Arch will likely take you by surprise. Delicate Arch sits atop an immense and impressive sandstone bowl. Unlike many of the other arches in the park, Delicate Arch is freestanding. It doesn’t have a cliff behind it, and it doesn’t span between two rock walls. 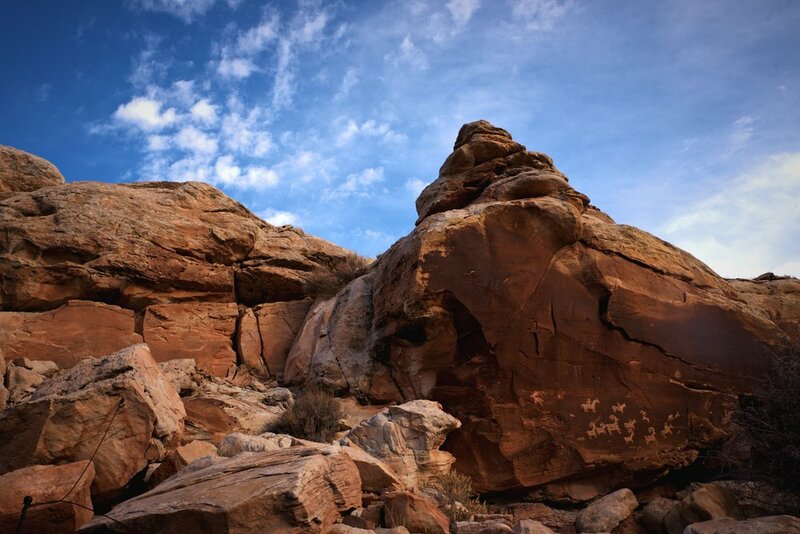 It stands alone atop a massive sandstone bowl, high above the surrounding desert. Delicate Arch is the largest free-standing arch in the park. The opening beneath the arch is 46 feet high and 32 feet wide. Delicate Arch is huge—you can see Kaylee as a tiny figure under the arch. When you stand below Delicate Arch make sure too look up st the absurd rock above your head. The sandstone bowl that Delicate Arch is on top of is shallow enough that you can walk along the rim around to the arch. The arch has been know by a variety of names, including “Cowboy’s Chaps,” “Old Maid’s Bloomers,” and “Salt Wash Arch.” But somehow Delicate Arch seems appropriate, because although the arch is massive, this fragile piece of stone will only be around for a fleeting moment of geologic history. Walk around the edge of the bowl and stand beneath the arch. It’s dizzying to look up at the arch from underneath it. We started our hike fairly early in the day, and for a while we had Delicate Arch completely to ourselves—an experience that is unique to winter. 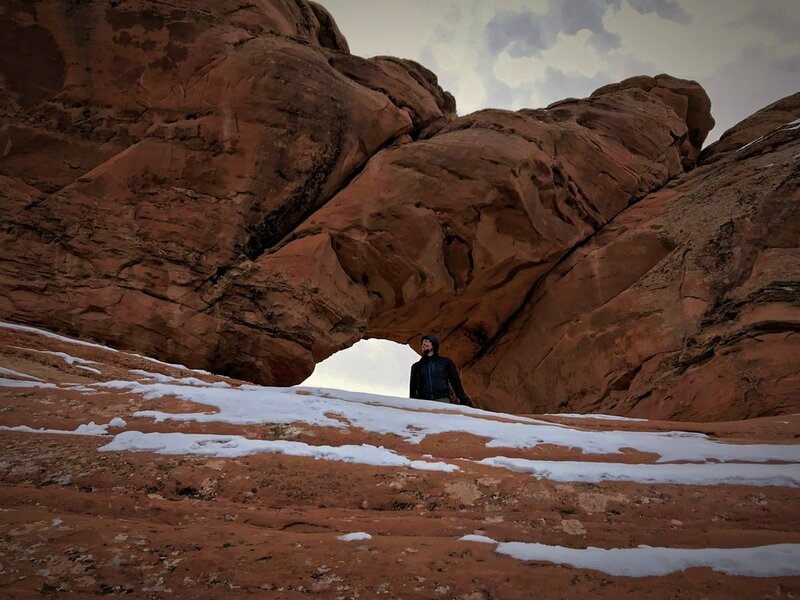 Ian climbed down behind the arch to snap this picture of Delicate Arch from another angle. The mountains behind Delicate Arch make the view extra beautiful. Beyond Delicate Arch, a vista of Arches National Park and beyond stretches to the horizon. The Arch frames the deep blue, snow-capped La Sal Mountains in the distance. The huge sandstone bowl underneath the arch is impressive on its own with its smooth rounded rock. If you’re brave, you can explore the area around the arch. Ian clambered down the other side of the arch to take some pictures from below. 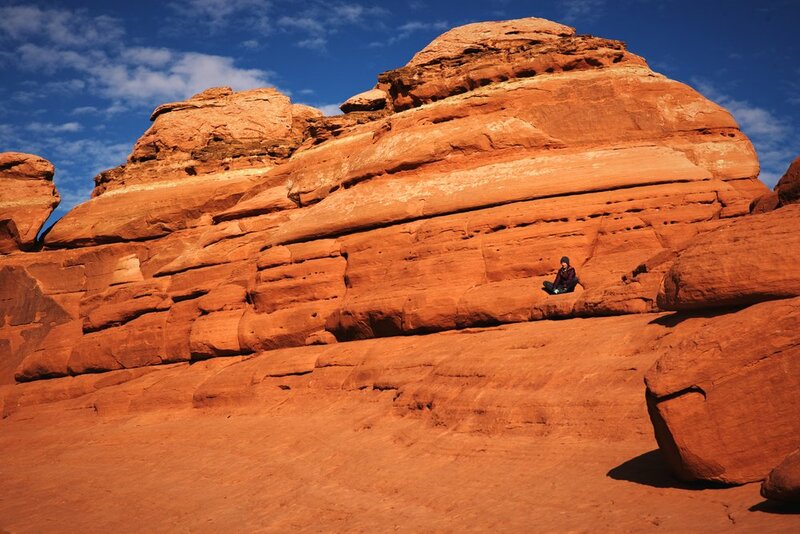 The sandstone bowl that Delicate Arch stands atop is impressive even without the Arch. 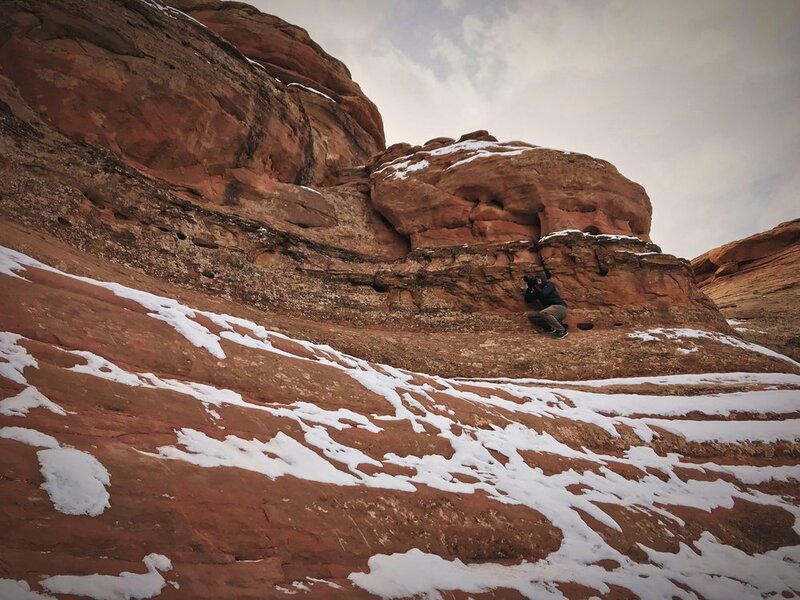 If you look into the sandstone formations around Delicate Arch, you may spot the beginnings of some future arches. 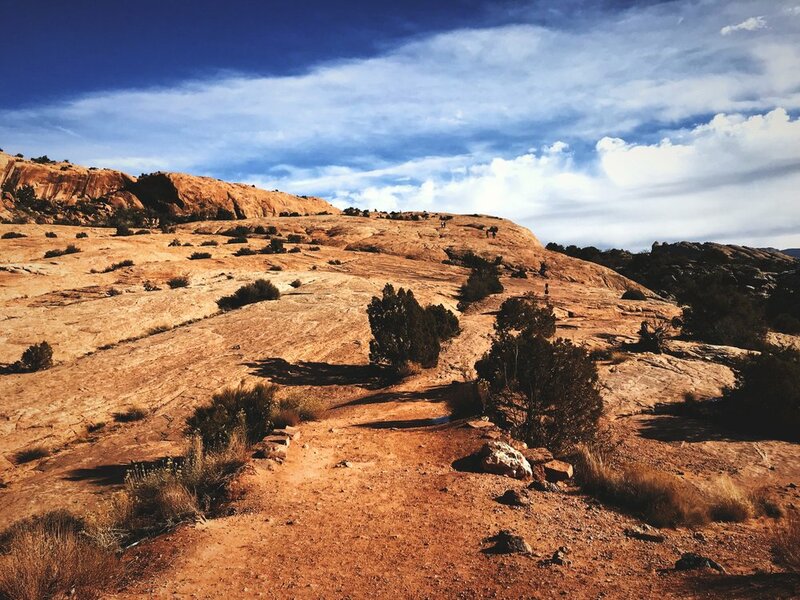 The trail back is easy, since it’s all downhill, but before leaving, be sure to take a few photos and then take in the tremendous and transient beauty of Delicate Arch with your eyes rather than your screen. On your way back on the ledge portion of the trail, scramble above the trail to find Frame Arch. This small arch frames the view of Delicate Arch perfectly. 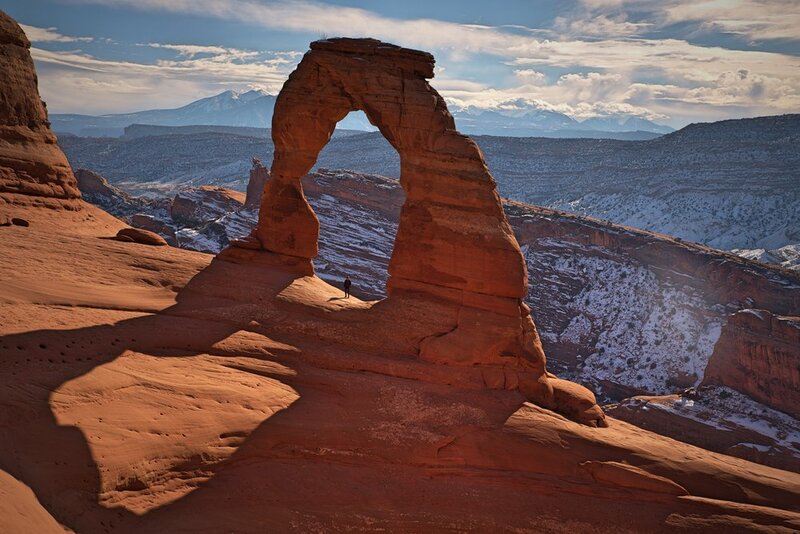 Frame Arch is aptly named, because it frames Delicate Arch. Ian stands inside Frame Arch, on the Delicate Arch trail. Ian photographs Delicate Arch through Frame Arch. If you didn’t look carefully, you might miss him in this photo!